I know, look listen, you're unhappy, I’m unhappy too. That's what a good compromise is all about. A good compromise is when both parties are dissatisfied and I think that's what we have here." This is more like the prevailing myth in procurement today—that everything has to be a compromise and you take what both parties want and you split it down the middle. The reality is when you split the pie down the middle, that’s a 'lose-lose'. The reason it’s a 'lose-lose' is because neither party gets what they wanted out of the deal. And this is what rookie negotiators see - one pie. You see we have a pie here, we split it down the middle and each party got half. Both parties wanted the whole pie. Neither party got the whole pie. Rookie negotiators see only one pie and that's the price pie. 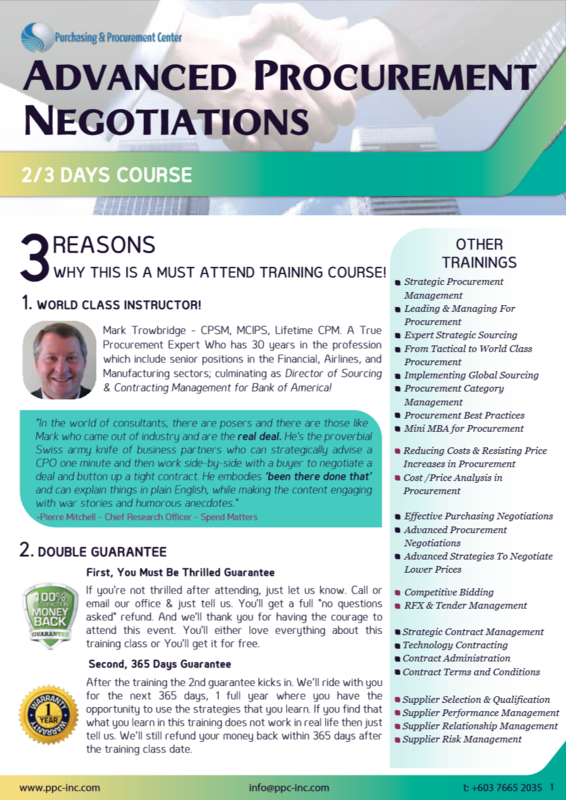 If you go into the negotiations as a Procurement Professional and you assume that the only thing of value for the supplier is price—guess what you are going to be negotiating? 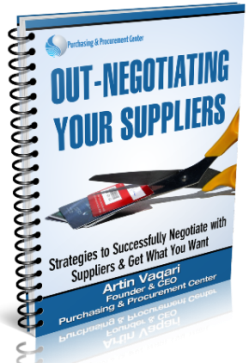 You’ll be negotiating price and the only thing you can do is move from that position in order to make the supplier happy. That is a rookie strategy that a true pro needs to get out of the business of doing. 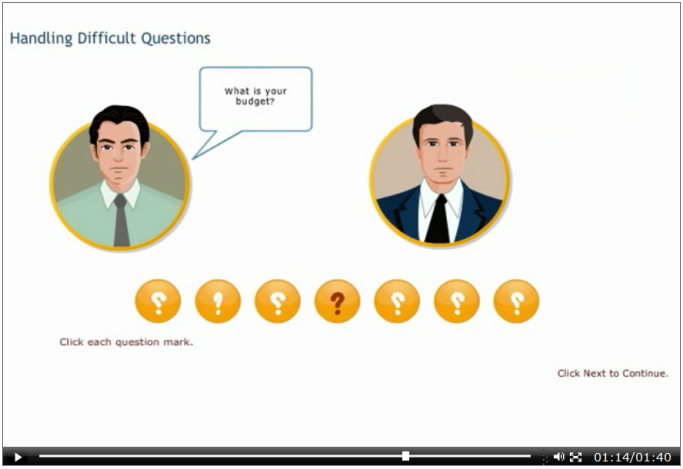 Reality - Rookie negotiators see only one pie and that's the price pie. Win-win has been talked about so much that it's completely lost meaning. The first thing is that win-win means meeting your high value objectives and having the vendor feel good about the deal. This is part of the art and science of negotiations. 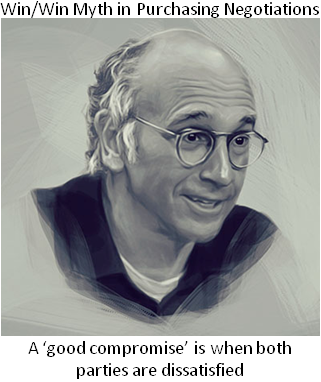 When you can achieve all of your biggest TCO objectives and still have the vendor feel good about it, instead of being bitter, then you can say that you've arrived as a Procurement Professional. It is critical that you understand what the other parties interest are before you can do this. The antiquated methods of negotiations that are out there, that are focused on getting the upper hand and painting the supplier in a corner with an unfair advantage, forcing them to agree to you doesn’t work. That is a 1950’s approach and it has no business being around in today's procurement business model. Even if you do employ those techniques, you'll have bitter vendors. Bitter vendors can and will find ways to increase revenue. They'll get their money back and every time you pick up the phone or your customer or end user picks up the phone to call the vendors, to ask for something, which will happen many times after the contract is signed, instead of them saying, "Sure, we're all over it, we'll be there, we'll fly somebody out", they'll do those things but they'll also send you a big bill and that's the difference. If you try and established an unfair advantage and take advantages of suppliers by using these antiquated techniques, they're still going to get their money and they won't feel good about the deal and you'll end up paying more overall. What will happen is you won't have a win-win, you'll have a win loose, and in fact you'll end up spending even more money. Tip number three here is that this is part of knowing when you've arrived as a Procurement Professional. Allowing the vendor to win while still meeting your objectives is an art form. What you want to do instead is rather than viewing negotiations as being one pie that you're trying to split, you need to learn how to create multiple pies. We want to make as many pies as possible - pies that have high value to the supplier below TCO impact to you. We want to try and give as many pies as we can to the supplier to make them feel so enriched from the deal, while you have not impacted your TCO proposition. 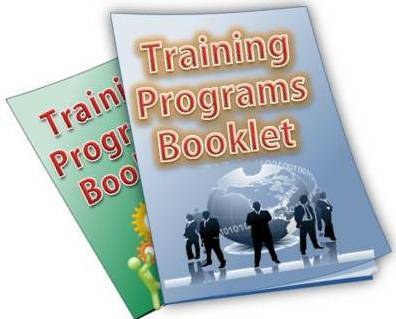 So think what other pies are there rather than the price pie - free training, warrantees, spare parts - what else? 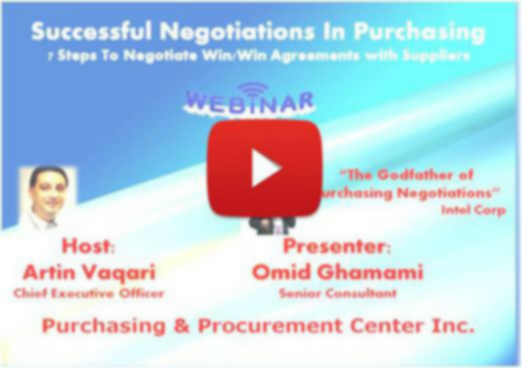 This article is part of what Purchasing & Procurement Center Inc will showcase during the upcoming free online class webinar "Successful Negotiation in Purchasing" - 7 Steps to Win Win Negotiations, with Omid Ghamami, who's been nicknamed the "Godfather of Negotiations" from Intel Corp. 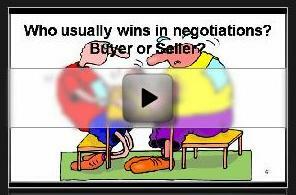 When you register for it here or fill in the details on the right, you will also get 3 Bonus Training Videos "The Truth About Purchasing Negotiations"